Aizawa brothers Suguru and Kakeru. Both are on the Soccer team, but in different ways. This article gives my first impression of Knight in the Area (Area no Kishi) based on episodes 1 through 3. The story is about a boy who is overshadowed by his brother, the Soccer team’s ace. Due to circumstances he is forced to step up and become a great player. Now some people dislike sports shows in general; this show is about Soccer (aka Football), so I don’t expect it to appeal to everybody. I also have one major concern about the source material. To get to the point, this show hasn’t proven itself yet, although I think it is possible that it will turn out to be a decent watch for some viewers. Despite it’s flaws, Knight in the Area is an interesting show, and I am interested in seeing what Tadashi Agi has in store for us. I’m not a huge sports fan, but I’m not a huge war fan either, and I’ll watch shows about soldiers. The big question is, will this show have a compelling story to tell? A strange encounter in the park at night. My biggest concern for this show is that the author of the manga upon which it is based is Tadashi Agi (writing under the pen-name Hiroaki Igano). Agi wrote the mangas for two other series that I have reviewed: The Case files of Young Kindaichi and Detective Academy Q. Both of those shows were Mysteries, not Sports genre. There is something I noticed when watching those two shows; both shows rely on character concepts, rather than developing complex and interesting characters. This really isn’t a serious flaw in a Mystery, since the focus in a Mystery is the plot, or more specifically the process of revealing the secrets behind the mystery. Knight in the Area has the same feeling; the characters aren’t deep and interesting in themselves, but rather are character concepts that are subordinate to the plot of the story. In other words, if the plot of the story turns out to be wonderful, this won’t be much of a problem. An event beyond their control. Now the thing about plot is that it isn’t just events, it is a collection of events that add up to something meaningful. And that is the good side of a story written by Tadashi Agi. There is a story. This isn’t random school life hijinx. Events aren’t put in to make things seem exciting — they have meaning in the context of the story that is being told. Of course the thing with a true story-based show is that you have to see how the story turns out before judging it. For this reason I can’t say definitively how I feel about this show. This show isn't quite as emo as this screen cap makes it look. In addition to the characterization, I would say weaknesses of this show include the quality of the artwork. That isn’t to say it is terrible, but it can’t credibly be termed anything better than average. Now to the producer’s credit, the animation of some of the gameplay scenes has been pretty good. 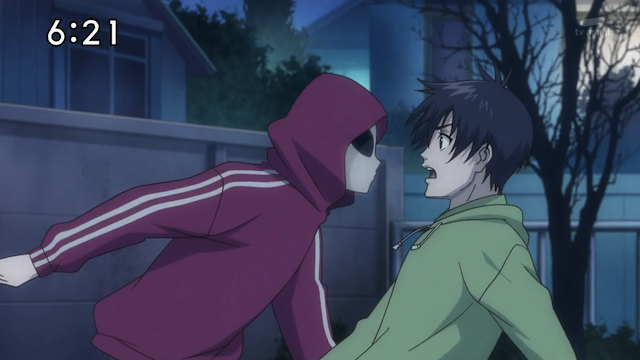 There has been very little actual gameplay depicted so far (given that this is a soccer show), but in addition to a few scenes of real gameplay (some in flashback), there have been some interesting scenes of Kakeru playing soccer at night with a mysterious person who wears an alien mask. This is an important and tricky thing to handle well. A number of scenes ambitiously attempted to animate tricky footwork, instead of simply showing long passes and people running. Aliens know how to play soccer, because they have been watching our broadcasts of the World Cup for years. 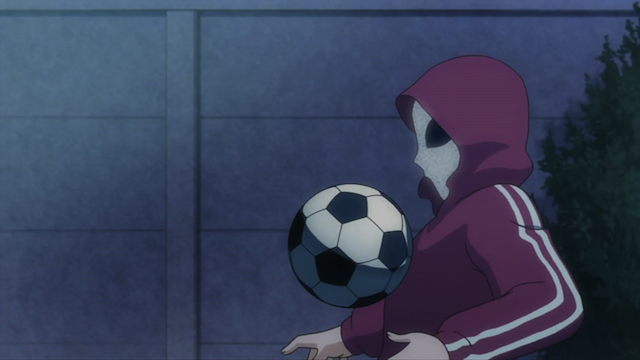 There is another positive aspect to having Tadashi Agi behind the story, and it intersects with the way that soccer is depicted in this show. Agi is a clever, thoughtful writer. This comes through in Knight in the Area with the central problem in the game that must be solved. The name Knight in the Area, refers to a striker, a forward player who manages to get into the penalty area (the area around the opposing team’s goal) to score. 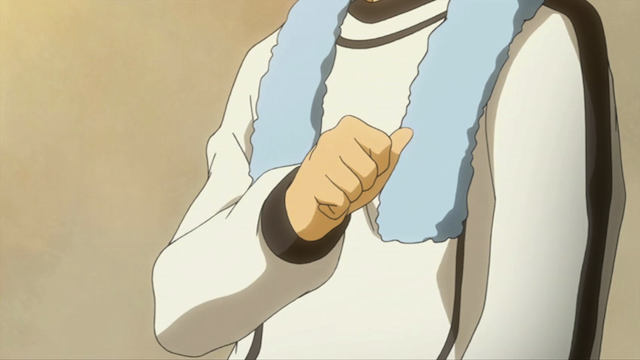 Suguru, Kakeru’s brother, is hailed as a great conductor. He stands in the mid-field and orchestrates plays, by conveying the ball to one of the forwards. But Suguru stresses that his role is meaningless if there is no knight capable of receiving his passes in the penalty area. The second episode has the most detailed gameplay of the first three episodes, and instead of focusing on the score, it views the events through the lens of this forward pass. In fact the actual goal that won the game, not only isn’t shown, it is downplayed in post-game chatter. The significant moments are the almost impossible passes that Suguru makes to his brother. 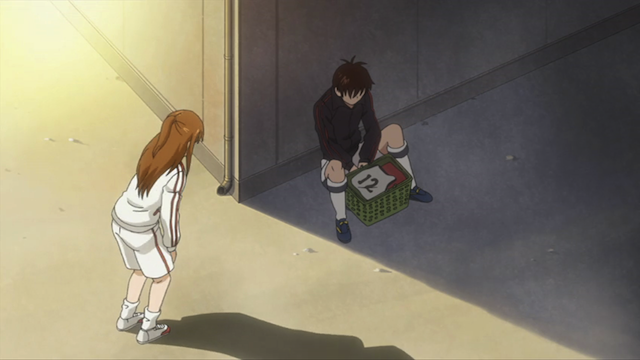 Despite never scoring, Kakeru is credited by the opposing team’s defense as having ground it down by playing so aggressively that their failure after Kakeru’s retirement from the field was already inevitable. And despite that, Kakeru is denied a spot on the team, because his failure to score will have a demoralizing psychological effect on the other members. Now I come to the elephant in the room. I don’t have a way on this blog to sensitively handle SPOILERS, so those who don’t want to know what happens in the first three episodes STOP READING NOW. 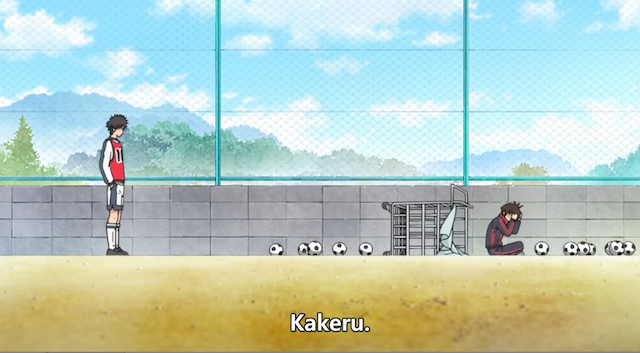 Kakeru just doesn’t seem to have the “heart” to compete. 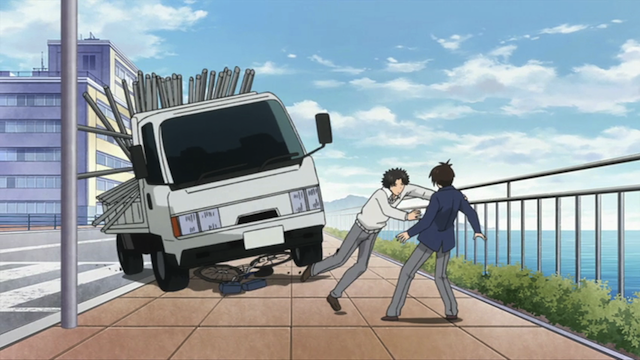 That all changes when a traffic accident leaves Suguru dead and Kakeru gets a heart transplant. Frankly I find the details of that twist a bit silly. I think Kakeru might have re-evaluated his life and attitude after the accident and could have had a “change of heart” without LITERALLY swapping his heart out. After the transplant some silly things happened. Honestly, heart transplants don’t cause personality changes. For me, this goes back to my earlier concern about Tadashi Agi, and characterization. Personally I think a reality-based (if melodramatic) change in Kakeru would have been favorable to this magical heart business. It is too early to tell if this will continue to be played up as much as it is. I hope it fades a bit into the background. Thanks for your comment. I usually don’t read very much manga, so I’ll just take your word for it.